This is part 8 of a 9-part series that will look at selected areas of interest to Municipalities, pertaining to IT Budget Planning. Please contact me if you would like copies of other articles. In previous articles from this series, we’ve touched on Subscriptions and related Services for various software components, so some of this will be reviewed. But we will look more closely at some options, and why they are critical to your overall IT Budget Plan. Anti-Virus: Anti-Virus software used to be sold in multi-year subscriptions – and some Vendors still offer this. But there were a few problems that lead most Vendors to move towards a monthly Subscription Service. The primary problem – that caught more than one Municipality – was not being aware of the annual renewal date. If the renewal date past without being acted on, the software stopped receiving daily updates to the virus definitions. Users may or may not have received a notice, but sometimes months went by without an update. This placed the Municipality at risk. The second problem was cost. A multi-year renewal for a large number of licenses could run into thousands of dollars and some Municipalities failed to budget properly for the expense. The advent of the monthly subscription model resolved both of these issues; as long as the monthly fee is paid, the software continues to be active and receive updates. Office Productivity Software: Most Municipalities use some version of Microsoft Office software. It used to be an outright purchase of the license – either through an add-on at the time of a new computer purchase, a straight (retail) license purchase, or through Microsoft’s Open License Program (OLP.) Except for some renditions of the OLP, once a license purchase was made, the User was stuck with the purchased version. If the Municipality was buying new versions at the time of a new computer purchase, it meant that a Municipality was using and supporting as many as 4 different versions of Office, which lead to no end of document compatibility and formatting problems. Performing a complete change-out of all licenses to the latest common version was usually cost prohibitive, and so Users just lived with the problem. With the introduction of Office 365 (O365), Microsoft moved to a monthly subscription model. This saved on large capital purchases of outright license purchases. However, the real advantage was Microsoft’s commitment to update Office 365 Users to the latest version. Thus, as long as the monthly subscription is maintained, all Users have the latest version; document compatibility problems disappear. When O365 was introduced, Users received Office 2016. But recently, Office 2019 has been released, and O365 Users will be receiving the update automatically. There are two other hidden advantages to O365: the number of licenses can be adjusted monthly, according to the number of Users. Thus, Temporary Staff can be part of the program when employed, and easily removed once they are no long employed. License Management becomes easier. 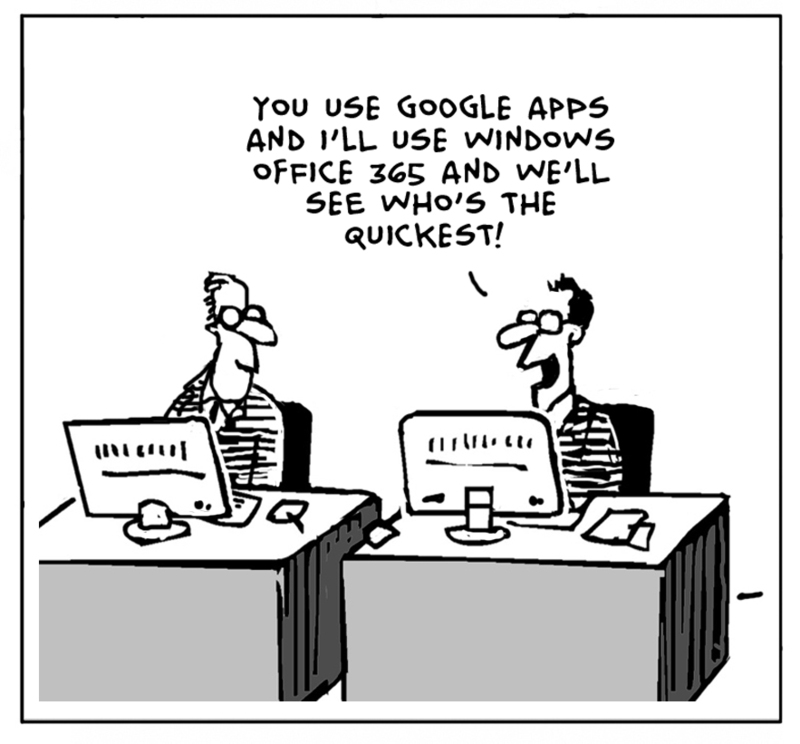 The second hidden advantage is that Microsoft allows O365 to be put on up to 5 devices for a single User account. Thus, an office workstation, laptop, tablet – and even the User’s home computer – can all have the Office software installed for the same prices as a single O365 monthly subscription. Notice this is for a SINGLE USER… it doesn’t mean you can use a single subscription for 5 USERS. O365 comes in a variety of different options, depending on the software applications, storage and Email capabilities required. Costs range from $8 to $30/month per User. Different versions can coexist on the same network. In addition to O365, most Municipalities are heavy Users of Adobe Acrobat software, to produce and manage PDF documents. It is usually installed for Administration-office Users. Adobe’s Subscription Model is an annual fee. Other Vendors of Specialty Software (Financial, Engineering, Mapping/GIS, Graphics Design, Bylaw Enforcement and Facility Booking – to name a few), may also be moving to a subscription-based model and their costs will have to be added to your budget. Firewalls: With the rise of Malware and Internet-based Hacker Attacks, Firewall Manufacturers have moved to a subscription-based model to keep the firewalls up-to-date. Firewalls segregate and protect the internal corporate network from the Outside World of the Internet. They do this by inspecting each parcel of information (a packet) that is inbound and outbound from your internal network and the Internet. At the same time, they ensure traffic is routed correctly – in that the information gets coded to be delivered to the correct User/workstation; this is why early Firewalls were called Routers. The protection/filtering aspect of modern-day Firewalls are its’ most important functions. Firewalls inspect each packet by digitally reading it and looking for common patterns that identify a virus, or undesired or dangerous piece of information. They do this by comparing each packet to a library of known packets that are flagged as bad. It used to be that the library was stored locally on each Firewall, and updated monthly – or on some other schedule. However, with the explosion of Internet Attacks and Malware, the locally-stored library method quickly became impractical, as new viruses and attack-vectors were being created daily. Firewall Manufacturers changed to a different Technical Architecture; they started to store the libraries on large central servers that they maintain – and the Firewalls were re-configured to use the centralized server libraries. This had another benefit: when a submitted packet is identified as being suspicious, it’s tested on the central server in a protected environment called a Sandbox. If it’s found to be dangerous, the new definition is added to the library, which benefits all Firewalls connected to the Server. Thus, thousands of Firewalls are contributing to keep the library up-to-date. Newly-discovered viruses are called ZERO-DAY viruses. Of course, the Business Model for Firewall Manufacturers changed from being Hardware Suppliers to becoming Service Providers of Internet protection libraries. They are more akin to Razor Blade Manufacturers. The cost of the Firewall Hardware (Razor) is small, when compared to the overall cost of the subscription (Blades) over 5 years. Backup Software: With increasing importance of solid reliable backups, it’s becoming vital to have good Manufacturer Support for the Backup Software. Not only do you get regular updates to their software, you also get Troubleshooting and Advanced Recovery options, if a Backup is corrupt. Two-Factor Authentication: It is becoming normal to validate Remote-Access Users with 2 independent methods of identification – a password and an independent message confirmation (sometimes a text message received on the User’s Smartphone that requires acknowledgement.) This is a monthly Service offered by many Vendors. Vulnerability Scanning: This is a Software Service installed on your network that scans for new devices and accesses the increase/decrease in vulnerability to your network. Thus, if a User connects a Smartphone to the corporate WiFi, the new device is identified, evaluated, and reported on. Reports are analyzed and activated by a Technician. The nature of Subscription Services is to reduce or eliminate Capital Expenditures. In our example, the only Capital Cost will be the purchase of the Firewall Hardware appliance. Of course, subsequent budget years will not require the Firewall Appliance purchase, so there will only be Operational Costs. The reason the Anti-Virus Software is for 30 units, is that the Server environments (1 x Physical Server + 4 x VMs) also need protection. Next week, we’ll explore Managed Services & Break-Fix in more detail. Until then, please contact me or your Account Manager, if you would like some personalized help with some stress-free Subscriptions Budgeting.